The fighting today (August 3rd) on the Lebanese border may have been deliberately staged by the Lebanese Armed Forces (LAF) for reasons that are still unclear. Perhaps they wanted to demonstrate to Hezbollah that they are also able to attack Israel inside Israel, perhaps the unit involved is actually a Hezbollah unit in LAF uniforms, or perhaps it has something to do with Syrian President Bashar al-Assad’s visit to Beirut, or Palestinian President Mahmoud Abbas’ tentative moves towards negotiations. Israel believes it was the work of a Hezbollah-affiliated rogue LAF officer. According to reports corroborated by UNIFIL, the operation had been coordinated in advance with UNIFIL, which in turn informed the Lebanese army as it always does. This information and the intention of a rogue Lebanese officer to stage an ambush were apparently passed on to elements in the Lebanese media. Unless they knew, in advance, what was going to happen, there was no other reason for the Lebanese journalist Asaf Abu Rahal (who worked for the Beirut paper Al Akhbar, and was killed during the incident) to be in such a remote corner of Lebanon covering routine Israeli operations. It appears that he was there to put the right spin on events, and to drive the message home he was accompanied by these photographers to create a Lebanese version of events – a Lebanese Pallywood production. Several of the photographs that have been widely posted were clearly taken before the incident and, apparently, immediately after the firing began. The published photographs follow a clear timeline. Thus it would appear that the photographers in Lebanon affiliated with Associated Press and Reuters who took the pictures were in place before the incident started. 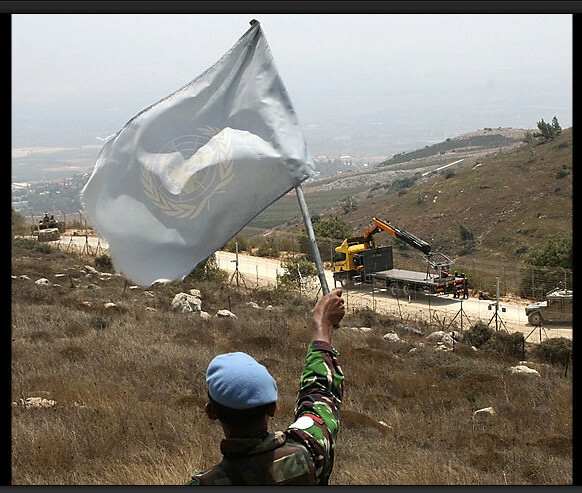 A picture of the UNIFL soldier waving a UN flag was taken by Ronith Daher-AP, and it appears to show the same truck that Israel was using to mount the crane that would lift the tree out of the area – if so, Daher was there before the firing started, and it is apparent that UNIFIL was on the spot to supervise the Israeli operation. Photographer Lutfallah Daher-AP was able to get a clear picture of the tree-clearing operation as it was in progress before the firing started. 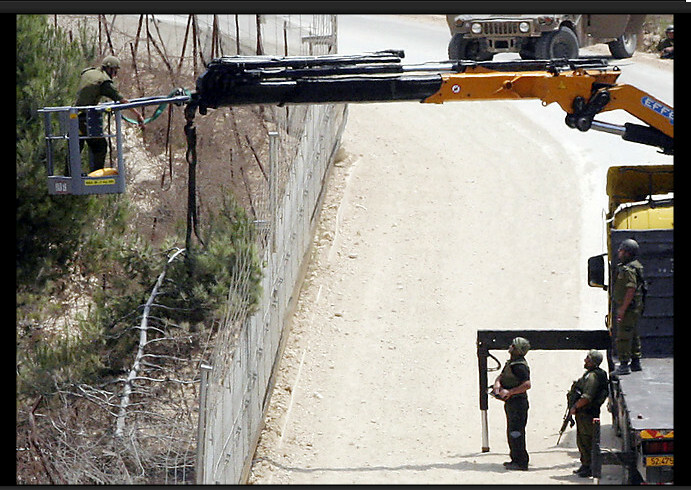 In the image below you can see the fallen tree that the soldiers were trying to lift out of the area between the security fence and the “Blue Line” – the border between Israel and Lebanon. It is clear that the Israeli soldiers, equipment, and the command jeep were on the dirt road that runs alongside the fence, inside Israel (the fence is also inside Israel). No reasonable person could regard this as a threat to Lebanon, and clearly there was no incursion by Israel. 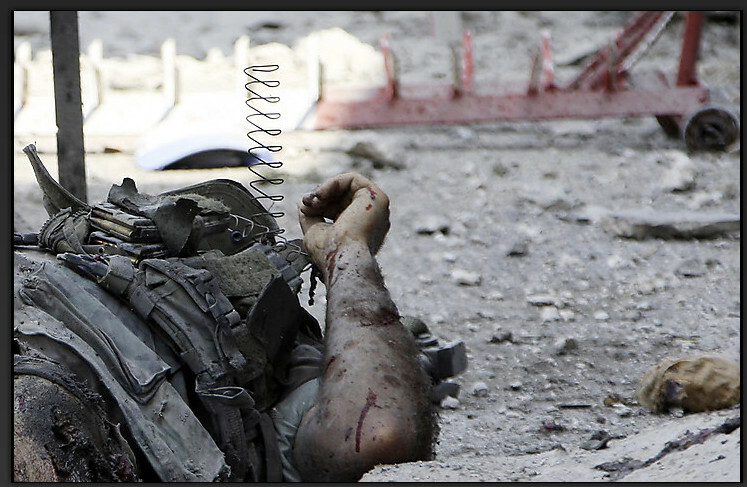 Ali Hashisho-Reuters took the following picture of a dead Lebanese soldier lying in the street. Surely the dead soldier would have been evacuated as soon as possible, so this photographer seems to have arrived on the scene remarkably quickly – or, more likely, been there in advance. 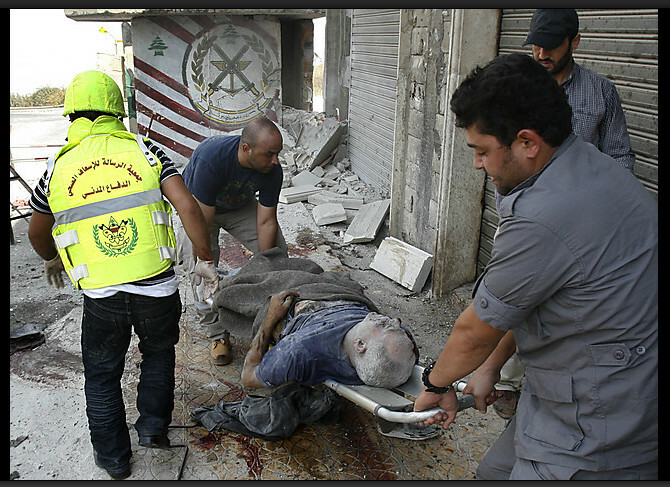 We have a picture of the dead journalist taken by Mohammed Zaatari-AP. 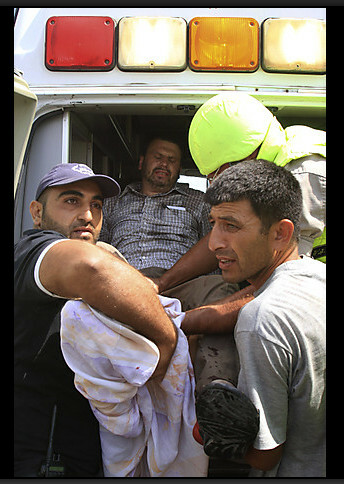 And, there’s this one of a wounded person being loaded into an ambulance by the same photographer. The initial photographs must have been taken as soon as the incident started and the later ones during the incident unless the Lebanese left the dead and wounded in the streets until the photographers arrived at the border from Beirut (where Abu Rahal and most likely they too are based). This would take quite some time as anyone who is familiar with the hilly roads in Southern Lebanon can testify. Thus it looks extremely likely that the ambush was planned well in advance. If so, Abu Rahal and others – perhaps the editorial staff of Al Akhbar and possibly the Reuters and AP management in Beirut – knew what was intended and dispatched Abu Rahal and the AP and Reuters photographers to be on the spot in advance to cover the incident. Reuters has in the past been caught out for its reliance on Arab “fauxtographers” who feed it Photoshopped and manipulated pictures. If it is shown to be true that Reuters and AP photographers made themselves available to cover a murderous ambush, it raises significant questions not only about Lebanon and the LAF, but also the role of AP and Reuters in the region – once again. The Guardian, or The Onion? I’ve tried to find out from UNIFIL’s web-page their command-structure i.e. who is the overall boss etc. I had no luck it looks extremely murky. EoZ has undug a map showing which nation’s forces occupied what but I wanted to know the head of the fish and his deputies. As of now no such luck. Also no press-release on their site yet. I think this assault on the IDF was Hisbollah showing that its “muscles” are everywhere i.e. that they are the state of Lebanon, that they are doing whatever Iran likes and in this case they murdered a man and injured another to show the Saudi king the finger. From Israel Matsav: UNIFIL troops amd LAF “mingling”. In other words, Hizballah guilty and UNIFIL complicit? For a wonder Sky News has acknowledged that it was all on our side of the border and that the photographers must have been tipped off that there was going to be an incident, giving times of day when they were there and when the incident occurred, and ends saying that it arouses a lot of speculation in Jerusalem. Well. A little narrowing down might be polite here as Israel only recently complimented the Italian contingent of UNIFIL for its good work. Perhaps: In other words, Hizbollah guilty and Indonesian UNIFIL contingent (seemingly) complicit? Yes, the suspicion attaches to the Indonesians only and Israel Matsav might now have clarification. Haven’t looked yet.